– this is the basic understanding of how to define Karma and how the term is used by most people when explaining a reaction to a negative action. Its equivalent is Newton’s Law, for every action there is an equal and opposite reaction. To understand the full extent of this article and how it relates to Karma, you must be aware that it is closely related to reincarnation. Today, there are thousands of documented cases of reincarnation, the most prevalent study is one administered by Dr. Ian Stevenson and his colleagues of University of Virginia where they recorded 2,500+ cases. In approximately 1200 of these cases, the child’s past life memories could be objectively validated through research. In none of the cases was the child a famous person in the prior incarnation. 1) Karma is NOT a punishment. Karma is for us to learn and grow. Every situation is a reward by offering us a lesson. Below when I use the term “correct karma” – if you behaved badly with or without your knowledge you are not correcting karma by seeking forgiveness which you should do anyways to heal. It means your lesson has been learned or you have just become aware to something you were previously blind to, the reason you needed to seek forgiveness in the first place. Your awareness has expanded to understanding your actions and reactions. 2) Some situations are not due to karma. Not everything bad that happens to you is your fault. There are always random events of people creating new bad karma and you can be caught in the middle of it. This person will need to correct their karma to you in this life or the next lives. Being said, this does not happen as often as you might think. 3) Karma does not always take effect in this lifetime. Sometimes what you do in this life time affects your next life. Sometimes you are being rewarded or punished for choices made in your previous life. 1) You are being punished for previous life acts and propelling yourself forward to a better life will not be an easy feat. 2) Your higher self knows that a hard beginning will propel you forward to achieving a much better life. 3) You are a spiritually advanced soul who has incarnated to help other people accumulate positive karma by allowing them to help you or you are an inspirational teacher for those less fortunate. This last reason reminds me of a video I recently watched YouTube video where a young boy and his brother conducted an experiment by pretending their youngest brother was a homeless boy on the cold streets of New York laying on the ground without a jacket covered in newspapers. 2 hours passed where people kept walking past him, most looked at him for a second and continued walking. Some people looked at him for 5 seconds then continued walking. In the end, the only person who stopped to help this young boy was another homeless person who gave him the jacket off his own back. Then he continued to give more – he offered some compassionate uplifting words and the spare change in his pocket for food. 5) You can correct karma in your dreams. When I attended an Eckankar meeting for the first time, where we discussed soul traveling, this was the first time I heard that you can correct karma and accumulate bad karma in your dreams. Throughout history, there has been an importance stated on dreams for various psychological and spiritual reasons but the one that comes most to mind is your dreams are your guide. Dream journaling, dream interpretation and lucid dreaming are practices many currently prioritize. To many, the dream state is just as real as when we are awake. I, myself, have interesting situations where I talk about dreams with friends and we happen to have similar dreams from previous lifetimes. This one topic could be an article just itself, but that is for another day. 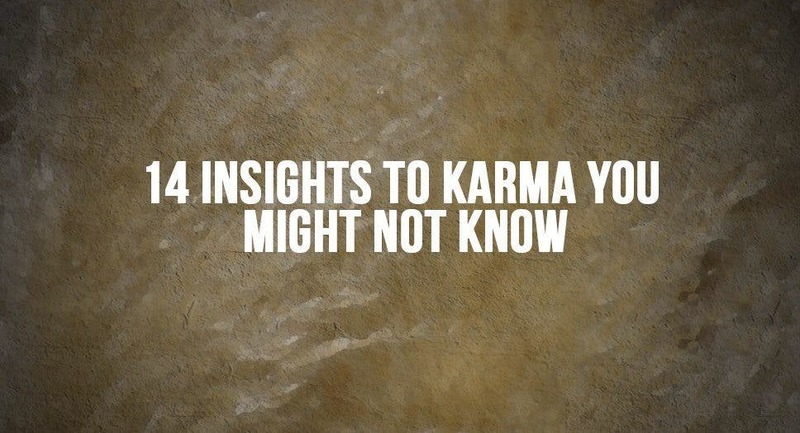 6) Your thoughts can correct karma. When you heal your lower thoughts of anger, jealousy and fear by transforming them into loving, compassionate and understanding thoughts, this will begin a streak of good karma to come your way. Our thoughts are the conductor of our actions and responses. One could easily assume they are healed and assume the thoughts of a positive mindset, but your painful memories need to heal from the bottom up. If not, wounds can easily re-open without warning. 7) Spiritually evolved people cannot tally negative karma. Once a person has achieved a high enough level of awareness, the universe will not allow them to dish out any more negative karma. Any choice that puts a tally in the bad column is immediately responded to for this person to correct. Lesson after lesson will be presented until it’s corrected. The difference between some karma taking lifetimes to correct and moments to correct is the person’s level of awareness. 8) You might marry your enemy in a previous life. According to karmic laws, you will not be romantically attracted to a person you do not have karma with good or bad. With some people you achieved so much positive karma together in previous lives; you can feel it in their presence. With others, you might have a hot and cold relationship together or you might make hell on earth for one another – if the relationship is perplexing you could have been enemies in one or more lives. Sometimes, the dating game can be karmic correction after karmic correction. There is a pull unknown to you, but it exists. 9) You accumulate the most karma by raising children. Raising a child is a selfless act if you are the majority of parents. It’s rewarding to care for a child, but the reasons are vast more than just the experience of love to give and receive. You will discover more of yourself by raising a child than any other act in life. You will discover your true strength. The connection shared while guiding your child from a baby to an adult, can be a healing process forcing you to relive your own childhood by correcting and understanding your pain with an adult mind. Then, you can share this lesson with your own child so they will not suffer in this way. Being said, not every parent goes in as a parent who has a lot to teach their children or is aware enough for the spiritual evolution process. Sometimes, it is the other way around. Your child is the teacher. Why end a soul connection? To not feel the connection to that person or end the pain after ending a relationship. This is something I know many people practice, but it is considered bad karma. If you end a soul connection, then your karma is not corrected and your lessons are not learned, by doing this you might project karma onto another person when it was meant for someone else (see #2). You have a connection for a reason. It is there for you both to discover. Loving contributions inspire the whole with good karma. Personal contributions, like art & invention, add to the whole with good karma. Lack luster contributions have no impact. Negative contributions hurt the whole. By changing who and what we are within our heart, life will follow suit and changes too. An advanced person responds with awareness to every living creature in the Universe. Every person is responsible for their own feelings and their own destiny and you do not have the right to carry someone else’s burden for them, as this would prevent their personal growth. Most of us project our own feelings on to others. When we speak honestly about our own feelings, we take responsibility for ourselves and in doing so we release the other person too. Your free will is the most powerful energy you possess. To contribute to whole, to create something for yourself – you must actively participate in life. Your personal awareness and universal awareness together can create moments that heal yourself and the collective.